A World Bank scheme aimed at building grassroots research capacity in Africa will nearly double its budget with a third, and probably final, investment worth at least US$280 million. The initiative, which loans money to African governments, has set up 46 education and research centres in 17 African countries, created jobs for hundreds of scientists and trained thousands of students — but both critics and supporters of the programme worry what will happen once the bank’s money runs out. “I see a big challenge when the funding ends,” says Patrick Ogwang, who leads a traditional-medicine research centre funded by the initiative, at Mbarara University in Uganda. He is eyeing industry partnerships as a source of future cash, but says that competition for research money in the country is fierce. The World Bank launched the African Centres of Excellence (ACE) initiative in 2014 with $165 million in loans. The money was used to create 22 centres in west and central African nations including Nigeria, Benin and Togo; these were competitively chosen in partnership with the governments taking on the loans (see ‘Excellence in Africa’). Two years later, the bank approved $148 million in loans to create 24 hubs in e﻿astern and southern African countries including Zambia, Mozambique and Rwanda. The third round, announced on 31 August, pushes the World Bank’s total investment past $500 million, making the project one of the biggest-ever science-supporting programmes on the continent. It once more targets West and central Africa and may also eventually include an extra $50 million from French development agency the AFD. Governments that receive the loans give out five-year grants that allow centres, which are linked to established universities, to invest in infrastructure, staff and financial support for students. They all focus on local research challenges such as maternal health, plant breeding, sanitation and infectious diseases. The West and central African centres have enrolled about 6,500 master’s and 1,600 PhD students so far, and the East and southern centres another 1,800 together. In the long run, centres are expected to sustain themselves financially, drawing on funding from governments, philanthropic organizations and industry. It’s important that the centres move towards sustainability, says Andreas Blom, the World Bank economist who has led the programme since its inception. Blom says the third round of loans will offer “weaning off” funding for existing centres in West and central Africa, as well as paying﻿ for new ones. But, he adds, it will probably be the scheme’s last investment. A handful of centres from the first round have managed to win prestigious international research grants from the likes of the Wellcome Trust, a biomedical research charity in London, and the US National Institutes of Health. But windfalls from national African governments are taking longer to materialize. Several African governments are in the process of creating national research-funding mechanisms — something that is rare in African countries. Kenya created one in 2015, and Uganda is expected to launch its programme later this year. Ghana’s government has said that it is earmarking $50 million for a research fund, but the proposal still needs parliamentary approval. Creating a fund, however, is one thing — sustaining it is another. The Kenyan programme had $30 million to spend in 2017, but its budget has been cut back to $27 million for 2018, owing to lower-than-expected tax revenue and the cost of back-to-back elections last year. Next year’s budget could be even smaller, officials say. Previous funding schemes have petered out: Uganda’s Millennium Science Initiative ran from 2007 to 2013, supported by $30 million from the World Bank. It created a number of science programmes in Uganda, but a review found that the country’s government had failed to produce the “continuous and predictable resources” required to keep those initiatives going. Critics of the ACE scheme say that it has allowed governments to delay making substantive national investments in research. Governments have 40 years, including a ten-year no-payment period, to repay the money at low or zero interest. “Many African governments, with short political life spans, are not really concerned about who will pay and how the loans will be paid,” says John Mugabe, an expert on science policy in Africa at the University of Pretoria in South Africa. He thinks the bank should have required governments to co-fund the centres. Representatives from the governments of Ghana and Nigeria told Nature that the ACE loans complement their plans for national funding. 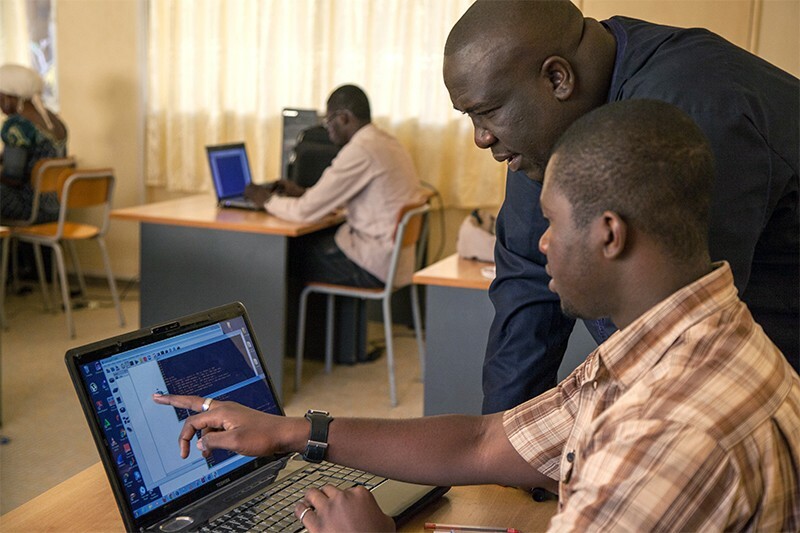 In Ghana, higher-quality research proposals will reach the country’s national research fund thanks to the laboratories set up and scientists trained under the ACE scheme, says Mohammed Salifu, executive secretary of the Ghana’s National Council for Tertiary Education. 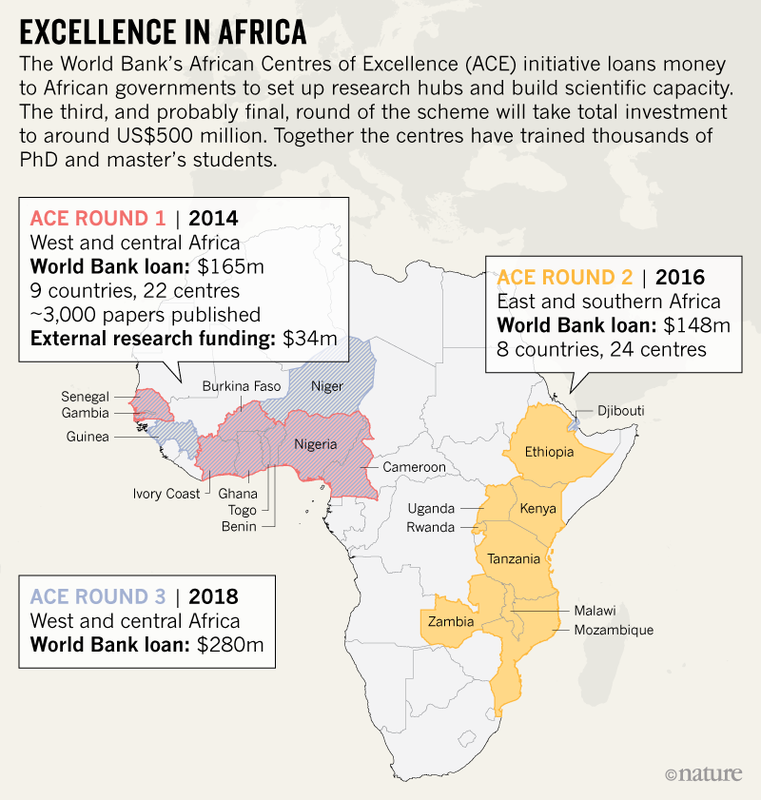 “The ACE scheme compelled African governments to fund science and training at a level they would never have voluntarily done,” says Gordon Awandare, a biochemist from the University of Ghana in Legon. His centre, the West African Centre for Cell Biology of Infectious Pathogens, is one of the scheme’s most successful: its researchers characterized a new malaria vaccine target and built Ghana’s first high-performance computing centre for genomics.